Airs Conant, born in September of 1792, Bridgewater, Massachusetts, son of Elias CONANT. Airs died 10 April 1848, Foster Township, Marion County, Illinois. Burial in the Conant Cemetery. 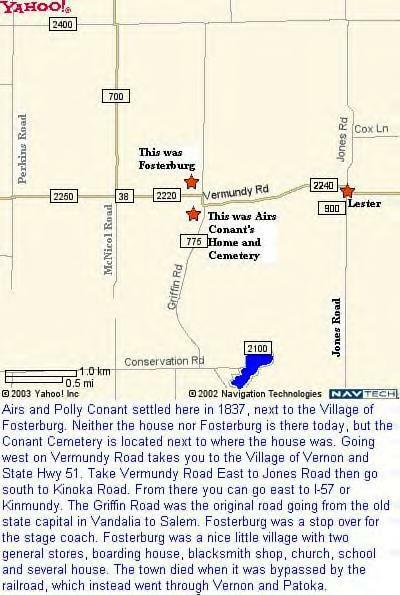 The Conant Cemetery is located in Section 17 of Foster Township. It is located just south of what use to be Fosterburg on the old Vandalia-Salem Road. This road is now called Griffin Road. It is a mostly dirt road. The cemetery is just before you get to the creek and is on the west side of the road. You have to walk through a field to get to it. It is very overgrown. There is a fence, much of which has fallen down, around the cemetery. There are three large cedar trees also. Airs married Mary "Polly" PEPPER 1814, near Athens, Clarke County, Georgia. Polly was born Dec 1795, Georgia, daughter of John and Esther "Hessey" (WHALEY) PEPPER. Polly died 10 Apr 1848, Foster Township, Marion County, Illinois. Burial in the Conant Cemetery, Foster Township, Marion County, Illinois. 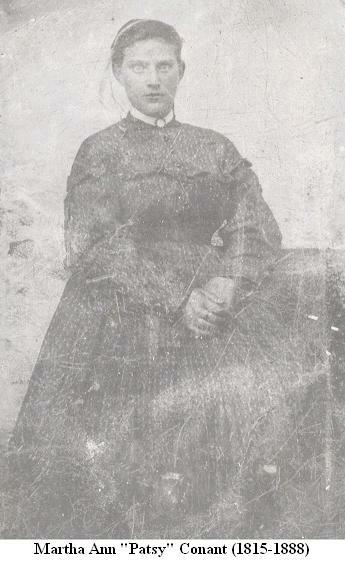 Esther was the sister of the Widow Mary JONES (mother of the Foster Township Jones'). She was also sister of Martha "Patsy" (WHALEY) ATKINS (great-grandmother of Mary Elizabeth (ATKINS) CONANT, wife of John Berry CONANT. She was also the sister of Elizabeth "Betsy" (WHALEY) MORRIS (Great-great-grandmother of Valinda Margaret (OWENS) CONANT, wife of Eli CONANT. All of these WHALEY sisters were the daughters of William and Hannah (BREWTON) WHALEY. 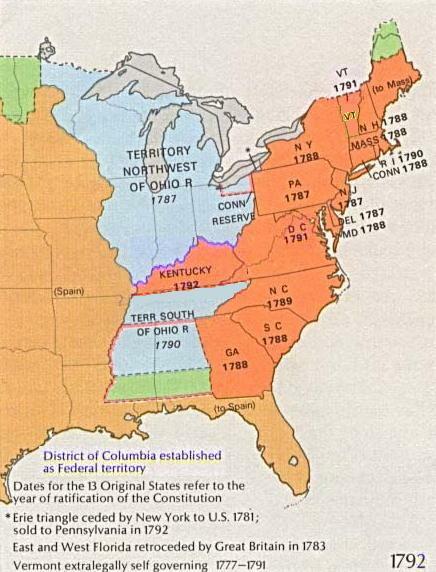 The 1792 Map shows the United States of America that Airs was born into. An America quite different from what we know today. The Treaty of Paris between Great Britain and the United States formally ended the American Revolution in 1783, nearly a decade before Airs was born. A year before he was born, Washington, District of Columbia, was established as the Capital of the United States of America. The first record of Airs CONANT in Georgia is when he joined the Georgia Militia. He was living in Jackson County, Georgia at the time of enlistment. Jackson County was established in 1801. It was named for James JACKSON. Jackson was a Revolutionary War hero, U.S. Senator, and governor. The flag above is the Georgia state flag prior to the Civil War, when Airs lived in Georgia. 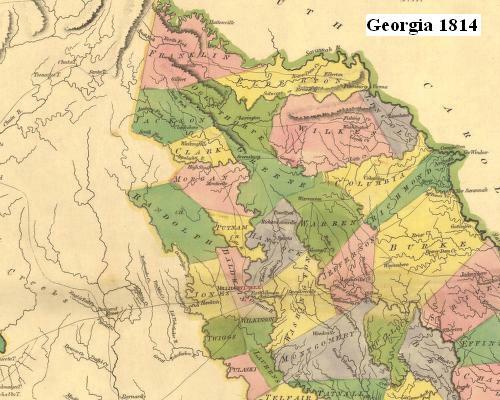 The map on the right shows Georgia in 1814, which is what it looked like when Airs first moved there. You can see that Walton County is not yet there. It would be just south of Jackson County and just west of Clark County. The area was still quite a wilderness. On 25 Aug 1813, at the age of 20, Airs joined the Georgia Militia. He served as a private in Captain Wilson McKinney's Company of Infantry, Lt. Col. Samuel Grove's First Regiment. He mustered in at Camp Hope, Jones County, Georgia, near Fort Hawkins. He was later serving under Col. Harris, Major Booth and General Floyd. 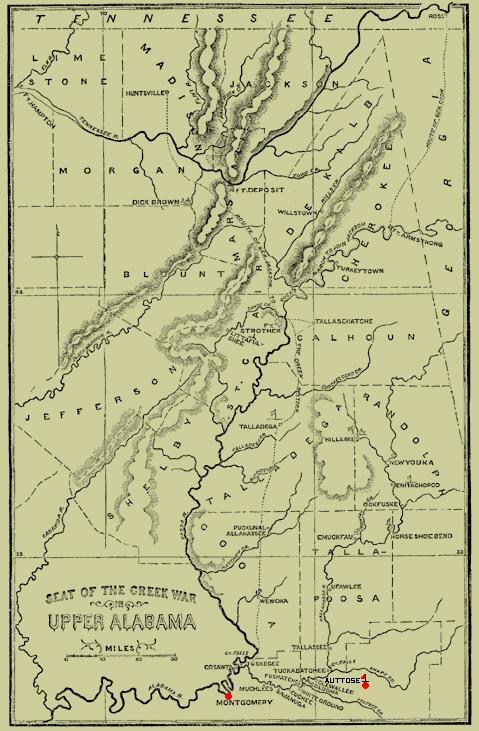 The map on the left shows the Battles with the Creek Nation. You can see where Airs was wounded in the Battle of Auttose, in 1813, which is marked with a red dot and flag. You can see its location in relation to Montgomery, Alabama. If you look at the upper right of the map you can see the location of Georgia. At the top you can see Tennessee. On 6 Mar 1814, Airs was honorably discharged. He served for six months and ten days, receiving $53.50 as his pay for his part in the War of 1812. Airs then returned to Jackson County, Georgia. From Jackson County, Airs moved to the neighboring county of Clarke County, where he married Mary PEPPER. Clark County was established in 1801. It was named for Elijah CLARKE, leader of the ill-fated Trans-Oconee Expedition and Revolutionary War hero. In 1820, the census shows Airs CONANT living in Athens Township, Clark County, Georgia. 1 male 16-26 (Airs); 1 female 16-26 (Mary "Polly"); 1 female under 10 (Martha Ann "Patsy"). The only other Conant in Georgia in 1820 was a Jeremiah CONANT who lived in Monticello Township, Jasper County, Georgia. That family came from South Carolina to Georgia and often their name was spelled CANANT in records. Many of the Conant/Canant family moved to Alabama. In 1820, Airs CONANT is also listed as one of the land owners of Clarke County, Georgia in court records. In 1824, Airs CONANT and family were in Clark County, Georgia. In 1825, Airs CONANT was serving as Justice of the Peace in Walton County, Georgia. Walton County which was created by the Lottery Act of 1818, was organized in 1819. Georgia's 46th county was named for George WALTON, a signer of the Declaration of Independence, who served as governor of Georgia and U.S. Senator. In 1830, Airs brought his family to Marion County, Illinois. He first went to Patoka Township. He then made three trips to Missouri before he decided to stay in Illinois. He first settled on section 11 of Patoka Township. He became the first Justice of the Peace in Patoka Township. His family was the fourth, non-native American, family in the township. On 10 Sep 1832, Airs CONANT became the first Justice of the Peace in Patoka Township. Airs was an educated man, which was not common during that time. He was also the first school teacher in Patoka Township. On 7 Oct 1833, Airs was a witness for the last will and Testament of Harmon HOLT. He signed his name Airs CONANT. He was paid $5.50 from the estate of Harmon�s, which was owed to him. In 1833, Fosterburgh/Fosterburg was officially established with a post office. It already had the stagecoach stop, being on the Vandalia-Salem Road, about half way between the state capital of Vandalia and the county seat of Marion County, Salem. Fosterburgh also had a horse mill. On 11 May 1837, Airs bought 40 acres of land in Section 11 of Foster Township, Marion County, Illinois. The NW1/4 of the NE1/4. The property cost $50.00, $1.25 an acre. The land was purchased from the government with President Martin Van Buren's signature on the deed, but not signed until 1 Nov 1839. It was recorded at the State Capital in Vandalia, Fayette County, Illinois. In Sep 1847, Airs was hired to teach a subscription school, four miles from his home. The first term lasted three months, and the second term lasted one month, when he stopped to put out a crop of corn. He was working too hard putting out the crop and drank too much water while overheated. Airs died less than a week later. Polly died within a week of Airs, leaving one minor child, John B. According to the Marion County Cattle Ear Mark Book, Airs Conant had the following for his cattle: Crop and under bit in the left and under bit in the right. Airs always spelled his name Airs, but on several records written by others, it was spelled Ayres as well as other spellings. 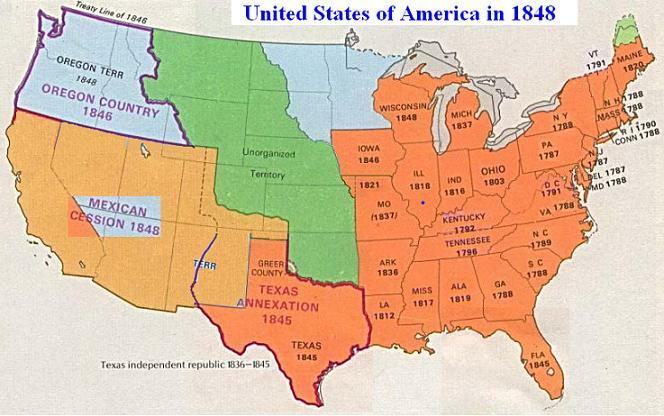 The map below shows how the Unied States of America looked at the time of Airs and Polly's death. A big change from what it looked like when they were born. 1. Martha Ann "Patsy" Conant, born Dec 1815, Clarke County, Georgia. 2. Susan Conant, born Oct 1817, Clarke Co., Georgia. Susan died Apr 1825, Clarke Co., Georgia. 3. Alfred Conant, born Nov 1819, Clark Co., Georgia. Alfred died Mar 1832, Patoka Township, Marion County, Illinois. 4. William Rice Conant, born 15 Oct 1823, Clarke County, Georgia. William married first Francis Swift. William married second Anna (Burton) Greenlea. 5. Elizabeth "Betsey Bird" Conant, born Jun 1825, Clarke County, Georgia. She died Nov 1842, Foster Township, Marion County, Illinois. Betsey Bird is buried in the Conant Cemetery next to her parents. 6. son Conant, born Jan 1828, Clark County, Georgia. He died Jun 1831, Marion County, Illinois. 7. Deborah Conant, born and died Mar 1829, Clark County, Georgia. 8. Mary Conant, born 20 Feb 1831, Patoka Township, Marion County, Illinois. Mary married James M. "Jim" Swift 5 Dec 1846. 10. son Conant, born Sep 1837. He died Oct 1840, Marion County, Illinois. 11. John Berry CONANT, born 17 Feb 1839, Foster Township, Marion County, Illinois. He died 28 Nov 1910, Kinmundy Township, Marion County, Illinois. The two photos below are the same grave stone. Airs and Polly's side faces west. The stone is actually on Elizabeth's grave. 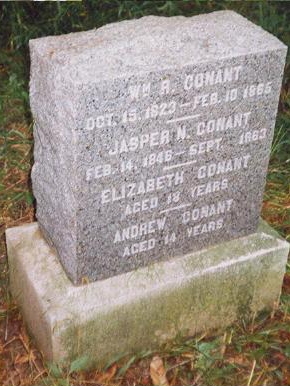 When facing west, the graves are left to right: William Rice CONANT, Jasper Newton CONANT, Andrew CONANT, Elizabeth CONANT, Polly CONANT, and Airs CONANT. They each have a little marker on them. Airs name was incorrectly engraved Ayres on the stone. 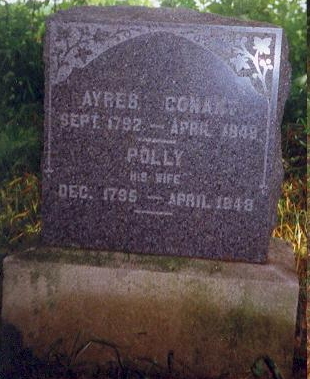 This grave stone was placed there in the 1900's by descendants of Airs and Polly. Martha Ann "Patsy" CONANT, born Dec 1815, Clarke County, Georgia. She died 19 Mar 1888, Kinmundy Township, Marion County, Illinois. She is buried in the John B. CONANT plot in the Evergreen Cemetery, Kinmundy, Marion County, Illinois. After her parents died, she went to live with her brother William Rice CONANT. When her younger brother, John Berry CONANT, got his own home, she went to live with him and lived with him until her death. She was said to have had one crippled hand. She never married. The photo at right is that of Patsy. Mary CONANT, born 20 Feb 1831, Patoka Township, Marion County, Illinois. She was the first Conant born in Marion County. She died 4 Sep 1854, Kinmundy Township, Marion County, Illinois. She was only 23 years, 6 months and 12 days old. She was buried in Shanghai Cemetery, just north of Kinmundy, Marion County, Illinois. Mary married James M. �Jim� SWIFT, 5 Dec 1846, Marion County, Illinois. Jim was born 25 Jun 1826, Tennessee. Jim died 25 Nov 1893. He is buried in Sandy Branch Cemetery. 8-1. John L. SWIFT, born Dec 1853, Kinmundy Township, Marion County, Illinois. John died 1920, Bucoda Township, Thurston County, Washington. John and Annie are buried in Forest Grove Cemetery, Tenino, Skookumchuck Valley, Thurston County, Washington. John married Anna �Annie� ___?___ , Jasper County, Missouri. Annie was born 1852. She died 1937. In 1860 and 1870, John was living with his father and step-mother. In 1880, John and Annie SWIFT were living in Sheridan Township, Jasper County, Missouri. With them were sons Fred E. �Freddie� and Myston SWIFT. In 1900, John and Annie SWIFT were living in Bucoda Township, Thurston County, Washington. Sons Myston and John and daughter Lulu were living with them. The town of Bucoda was originally called Seatco, an Indian word meaning "devil". The town was the site of the first territorial prison, 1874-88. Prisoners worked adjacent coal mines owned by J. M. Buckley, Samuel Coulter, and John B. David. To avoid name confusion with Seattle, the three men coined a new name by using the first two letters of their surnames -- Bu-Co-Da. The railroad adopted the name in 1874, the state in 1890. In 1910, John and Annie SWIFT were living in Bucoda Township, Thurston County, Washington. Children John, Myston, Fred and Lula were living with them. Annie had given birth to 10 children and 5 had already died at time of census. In 1920, John and Annie SWIFT were living alone in Bucoda Township, Thurston County, Washington. Next to them was son Jack SWIFT and his wife, Sylvia. In 1930, Annie SWIFT was living alone in Bucoda Township, Thurston County, Washington. 8-1-1. Fred E. �Fredie� SWIFT, born 1876/77, Jasper County, Missouri. He died 6 Apr 1949, Aberdeen, Washington. Fredie married 2nd Lucy M. ___?___ 1908/09, Washington. Lucy died 10 May 1950 at the age of 71, Washington. In 1910, Fred SWIFT was listed living with his parents in Bucoda, Thurston County, Washington. Lucy SWIFT was running a boarding house in Maxfield, Thurston County, Washington. Living with here were their three children. One child having died already. In 1920, Fred and Lucy SWIFT were living in Aberdeen, Grays Harbor County, Washington. With them were five children, one having been married. In 1930, Fred and Lucy SWIFT were living in Aberdeen, Grays County, Washington at 206 East King. Their real estate was valued at $2,000.00. Three of their daughters were living with them, Minnie FISKE, Viola and Ernestine SWIFT. 8-1-1-1. Minnie SWIFT, born 1896/97, Washington. 8-1-1-2. Walter E. SWIFT, born 14 Jun 1901, Washington. He died 7 Nov 1978, Everett, Washington. Walter married Laura R. FROGEN. 8-1-1-3. Howard F. SWIFT, born 19 May 1904, Washington. He died 23 Jul 1976, Aberdeen, Grays Harbor, Washington. Howard married Elsa M. �Elsie� ___?___ 1929/30. They had not been married a year in the 1930 census. She was born 17 May 1903, Washington. Her parents were from Germany. She died 5 Mar 1972 , Aberdeen, Grays Harbor, Washington. In 1930, the census shows Howard and Elsie SWIFT living in Aberdeen, Grays Harbor, Washington. Howard was a salesman for men�s furnishings. Elsie was a stenographer for a lumber mill. Their last place of residence was in Hoquiam, Grays Harbor, Washington. I don�t know if or how many children they had. 8-1-1-4. child SWIFT, died before 1910. 8-1-1-5. Laura May SWIFT, born 1910/11, Washington. Laura married George L. HUNTER. 8-1-1-6. Viola SWIFT, born 1912/13, Washington. 8-1-1-7. child SWIFT, died before 1920. 8-1-1-8. child SWIFT, died before 1920. 8-1-1-9. child SWIFT, died before 1920. 8-1-1-10. Ernestine SWIFT, born 1922/23, Washington. 8-1-2. Myrton SWIFT, born 1878/79, Jasper County, Missouri. He died 31 Oct 1910 at the age of 32. Buried in Forest Grove Cemetery, Tenino. In 1910, the census shows Myrton SWIFT living with his parents in Bucoda Township, Thurston County, Washington. He was 31 and single. He was working at the lumber mill. 8-1-3. James SWIFT, born 1881. He died 1889. Buried in Forest Grove Cemetery, Tenino. 8-1-4. George SWIFT, born 1883. He died 1889. Buried in Forest Grove Cemetery, Tenino. 8-1-5. Ernest SWIFT, born 1885. He died 1889. Buried in Forest Grove Cemetery, Tenino. 8-1-6. Bessie SWIFT, born 1886. She died 1894. Buried in Forest Grove Cemetery, Tenino. 8-1-7. Baby SWIFT, born and died 1887. Buried in Forest Grove Cemetery, Tenino. 8-1-8. Lula May SWIFT, born 22 Jan 1890, Bucoda Township, Thurston County, Washington. She died 17 Apr 1974. She and husband are buried in Forest Grove Cemetery, Tenino, Skookumchuck Valley, Thurston County, Washington. Lula married 1st Lyman Robert GROVE 14 Nov 1907, Olympia, Thurston County, Washington. They divorced in 1942. He was born 18 Jul 1882, near Harvard, Clay County, Nebraska, son of Lyman and Almira (WORKMAN) GROVE. Lyman died 9 Sep 1958, near Hanna, Alberta, Canada. Burial in Netherby Cemetery, near Hanna, Alberta, Canada. Lula married 2nd Joseph William "Joe" MILLER.. He was born 1878. He died 1974. In 1910, she had been married for two years and had one child, but she was recorded living with her parents and no husband or child with her. 8-1-1-8-1. Erbin Grove, born 3 July 1906, Bucoda Township, Thurston County, Washington, son of Lyman Robert and Lula May (SWIFT) GROVE. Ervin died 21 Oct 1987, Hanna, Alberta, Canada. 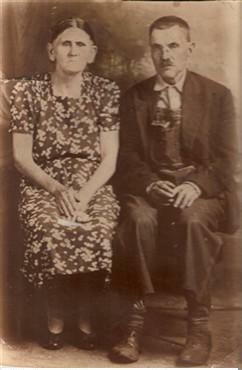 Erbin married Winnifred Margarite "Winnie" LEWIS 17 Jun 1935, Hanna, Alberta, Canada. 8-1-1-8-2. Ronald Arthur "Art" Grove, born 14 May 1911, Bucoda Township, Thurston County, Washington. Ronald died 18 Apr 1999, Longview, Cowlitz County, Washington. Burial in Rose City Cemetery, Portland, Multnomah County, Oregon. Ronald married Colleen CAMERON. She was born 29 Nov 1910, Haneyville, Alberta, Canada. Colleen died 30 Mar 1996, Castle Rock, Cowlitz County, Washington. Burial in Rose City Cemetery, Portland, Multnomah County, Oregon. 8-1-1-8-3. Glen Dale Grove, born 26 Aug 1915, Bucoda Township, Thurston County, Washington. Glen married Charlotte Charlotte HUDSON 17 Oct 1939, Twin Falls, Twin Falls County, Idaho. They divorced 1954. Daughter of Charles and Ida May (WORLEY) HUDSON. Glen married Colleen Eloise MICHAEL 15 Apr 1957, Stevenson, Skamania County, Washington. She was born 27 Mar 1930, Olympia, Thurston County, Washington, daughter of Homer Harper and Myrtle Margaret (ZINN) MICHAEL. (Note: Colleen's 1st husband was Charles Ray MORGAN, with whom she had 4 children, 2 daughters and 2 sons.) Colleen died 7 May 1999, Portland, Multnomah County, Oregon. 8-1-9. John "Jack" SWIFT, born 14 Apr 1894, Bucoda Township, Thurston County, Washington. He died 29 Mar 1920. Buried in Forest Grove Cemetery, Tenino. Jack married Sylvia ROGERS 18 Aug 1915, Snohomish County, Washington. She was born 1896, Michigan. Her father was from Germany. In 1820, the census shows Jack and Sylvia SWIFT living in Bucoda, Thurston County, Washington, next to Jack's parents. He was a carpenter contractor. I don�t know if they had any children. This is John PEPPERS, the great-great-nephew of Mary "Polly" (PEPPER) CONANT. He is the grand-son of Polly's brother Parker PEPPER, through his son Parker PEPPER, Jr.
Parker PEPPER, Jr. served in the military for the Confederacy during the Civil War, in Company F, 38th Tennessee Infantry. I received the photo from Helen HAYS who in turn received it from Ruth PEPPERS. Lyndon Hall and The Conant Family in England. ***Marion County Court House Records, including: Certificate stating Airs and Polly�s death, Airs� military service in the War of 1812 and that John B. CONANT was their only minor heir child, signed by Hardy FOSTER and Eli W. JONES; Record showing Airs and Polly�s deaths signed by Hardy FOSTER and William PERRYMAN; Two records showing Airs military record in War of 1812 signed by James S. MARTIN; Record describing Airs wound he received while serving the military; Record about Airs wound during military service in War of 1812, signed by Airs CONANT and Moses GARRETT. 2 October 1999 7:31 P.M. Copyright © 1999-2017 stephenfrakes All rights reserved.